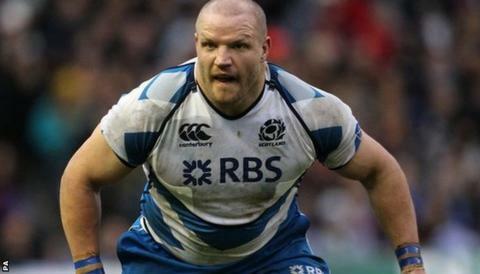 Scotland's most-capped prop Euan Murray has spoken to BBC Scotland regarding his decision to retire from international rugby. The 34-year-old won the last of his 66 caps against Ireland in March. International retirement means he will miss the upcoming World Cup. "Sadness that the time's over and there's also excitement about the next step. I'm happy with my decision and it's been a really difficult thing to come to. "But I think I've made the right choice." "I always wanted to play in this World Cup. When I had it in my sights, I thought, yeah, I could potentially get a third World Cup under my belt. "It's so exciting to play for Scotland in such a big tournament. Because it's a cup, you've got the opportunity of doing something really special. "But then we accidentally got pregnant; so that was a surprise and we're obviously delighted to be expecting our third child. "The baby's due in August and Scotland have loads of warm-up games in August. If picked for the World Cup, I'd have to leave my wife Sarah with three children under four-and-a-half for six to eight weeks." "It's really kind of him to say that and I really enjoyed working with him. "I've enjoyed working with loads of coaches over the years; it's been quite a journey, it's been fun." "Yeah, I'm hoping to play. Once we've got this season under our belts and hopefully win the league, I'll be able to get some clarity on what's going to happen." "It was a very difficult decision and it could've ended my career, but God has been kind to me and allowed me to have a longer career than expected. "I'm just really grateful for the time I've been able to represent the people of Scotland at rugby. "I'm really proud of the jersey and so happy to have been involved for so long."